Ol' Myrt here had a lot of fun this week responding to a few questions from our friends over at Geni.com. The conversation was posted yesterday in the Interview with DearMYRTLE on the Geni Blog. 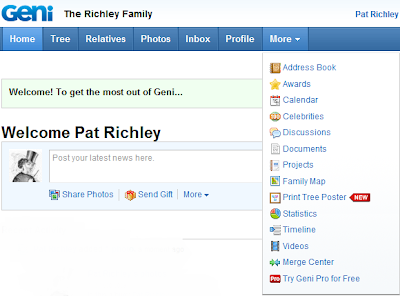 Geni.com is a "social networking" website where you can set up space to have an online family tree, address book, photo album, file documents and videos to share with family members you invite to the space. There are both free and upgrade options available. 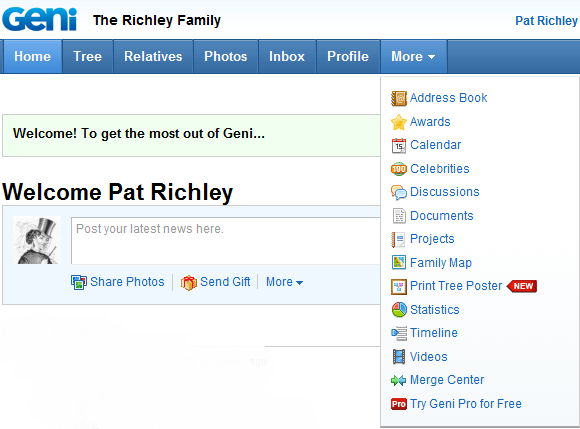 I've long subscribed to the Geni Blog and note that blog entries usually explain pending upgrades and maintenance issues, with a few non-genealogy celebrity profiles thrown in. What we tend to forget is that there is great value in preserving the current generations' stories and photos and that is what Genie is all about. How I wish I had more personal thoughts preserved from my US Revolutionary War and Civil War ancestors. Geni.com offers a "submit your questions to their Curators" service, so each Friday Geni.com will publish their Curators' responses to your questions. "Our greatest success as genealogy bloggers happens when we preserve the past for future generations. Recently, my oldest grandson was prompted by a 7th grade school assignment to call me and ask why our ancestors moved to the Americas. I chose five different ancestral groups, from various countries and time periods to explain it wasn’t all about religious freedom. (Children often equate all immigrants with those seeking religious freedom like early Plymouth Colony residents). At twelve, my grandson hadn’t considered that repeated crop failures, decades of war, or the desire to own property could also be push factors. Blogs are easy to create and provide genealogists a viable method to honor a specific ancestor and explore research possibilities in an open format. Because of my family blog entries, I found very distant relatives who inherited the only known picture of my 3rd great-grandfather. In turn, I was able to share pages from the old family bible that came down through our side of the family tree." Why Tami Glatz and I are so excited about Second Life.